It is good to be back racing. The first week back was absolutely postcard conditions with a consistent 12 to 15 knots from the east. It was a very nice afternoon to ease back into the racing. Not so our second week back! RKR hosted and finishing at Wangi. The day started out quite hot and light but when the Southerly arrived it started dropping the temp but really whipped up the water. Easily 1m wave around the bay with the extra boats from the other clubs making it quite a challenge around the start line. We had at least one MOB who was expertly retrieved! Kites were flown sparingly and many who did, struggled to control them. I don’t know how many paid a visit to the sail maker this week. No Pointscore racing this coming Saturday being Australia Day. I have had the pleasure of sailing on Wednesday over recent weeks and have enjoyed it thoroughly. It certainly is a competitive lot who race! Div 1 Dreadnaught , Ed Hillier, leads by 2 points to Xstatic , len Lavers, and Squid4Woodsy , Steve Liddell, on equal points and another 2 points back to Mortica, Geoff Gardner. Div 2 Young N Old, Cyril Picasso, leads by over 7 points to The Apple, Warren Hodgkins, with, Scamouch, John and Anne Skillicorn, 1 point behind in 3rd place. Jam, Mike Shaffer & Brett Lewis another point behind. Three races down and two to go in the ‘Hilliers Financial Advisors Lady Skipper series. Jayne Sherratt on Liaison has won all three races to date. Well done Jayne, will you be able to make it a clean slate? As mentioned last newsletter, NCYC are bringing their Force 24s to be used in the challenge. I call for expressions of interest for LMYC sailors to be part of this competition. We are working out the finer details of the sailing instructions with the racing to take place on Sunday 10 February. There are four of yachts so will be looking for two teams of four crew from LMYC. They do not need to be currently racing on Saturdays to be eligible. I encourage all to put forward our sailors for this challenge. Sailors do not need to be boat owners or even skippers but will need to be sailing members..
Lakefest will be on us shorthly. The LMYC Lakefest regatta on Saturday 16 February and Saturday 2 March. This year the regatta forms part of our yearly pointscore with the first day being two Windward-Leeward races and the second Saturday being an RKR race. If you are not entered in the yearly pointscore you can still enter the Lakefest Regatta. NOR and sailing instructions will be out soon. Please note that due to the expected numbers, for the windward-leewards each Division will be racing in separate areas on the lake. WASC and RMYCT will be assisting LMYC by each running one of the division. On the weekend between RMYC Toronto will again be hosting the ‘Heaven Can Wait regatta’ comprising a one lap dash, 12 hr race and the 24 hr race. On Friday 1 March the Friday Twilight race will be held by WASC as part of Lakefest. Adams 10s will be holding the nationals at LMYC on the Australia Day Long Weekend. I expect that there will be a few of our Adams entered and hopfully can retain the trophy at LMYC this year. Melges 25’s will be holding both their State and national titles at LMYC in March from 9th to 15th. The Melges always provide quite a spectical on Belmont Bay and I look forward to seeing them all flying around the lake. I missed at least one LMYC member who sailed in the Sydney To Hobart race. Peter Geddes was also in the crew with his son Lucas on Voodoo. Well done Peter. 505 World Championship – Fremantle. Neil and partner Wendy are off to Geelong for the Australia day weekend to compete in the Festival of Sails in a VX1. Please join me in wishing Neil and Wendy good luck down South. 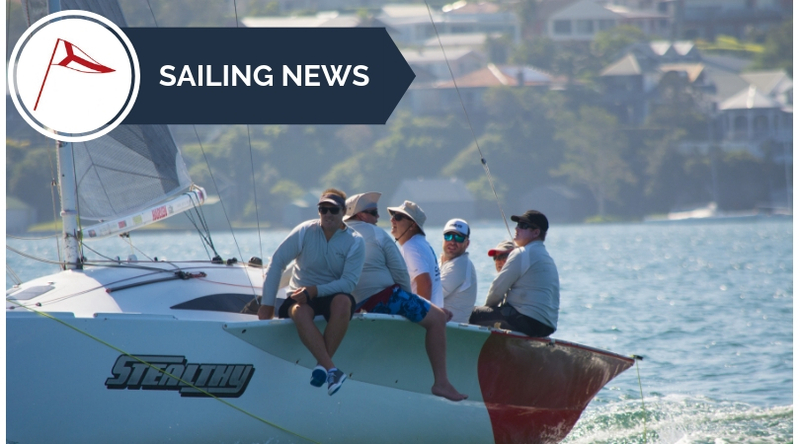 Following the Sabot championship our juniors had a week break before heading up to Port Stephens to race in the 2019 Flying 11 National Championship as part of the contingent from Belmont 16’ Sailing club. 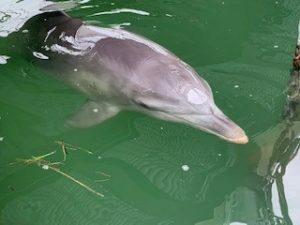 Finally join me in welcoming our new honorary member and marina resident who has been quite a bit of distraction in Belmont Bay recently. I don’t know his name or even if it is a he or she! The dolphin spent a couple of hours in the marina on Monday. I had heard many stories about it and one member may have had quite a surprise after cleaning the bottom of his boat!